Caorunn Gin | Premium White Spirits | International Beverage Holdings Ltd.
Small batch distilled and handcrafted at Balmenach Distillery in the Speyside region of the Scottish Highlands. Every drop from the world's only working Copper Berry Chamber is infused with six traditional and five locally foraged Celtic botanicals, nearly 200 years of heritage and a refreshing Scottish confidence - crafting a unique depth of flavour and character. 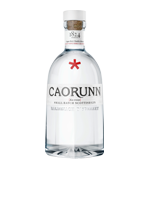 Caorunn Gin is expertly handcrafted in small batches of 1,000 litres a time by Gin Master Simon Buley. Harnessing Scotland's unique natural resources, Caorunn is infused to perfection in a unique Copper Berry Chamber, using the highest quality triple-distilled pure grain spirit, crystal clear Scottish water, six traditional (Juniper, Orange and Lemon peel, Angelica root, Coriander, Cassia bark) and five, handpicked, Celtic botanicals from the surrounding hills (Rowan Berries, Coul Blush Apple, Heather, Dandelion, Bog Myrtle). A Modern London Dry Gin, invigorating, clean and crisp with fruity, floral notes and long dry finish. Caorunn G&T is uniquely served with a freshly cut red apple.